Quick note, January 15, 2019. This post needs updating, for which I haven't had time as yet, but plan to. 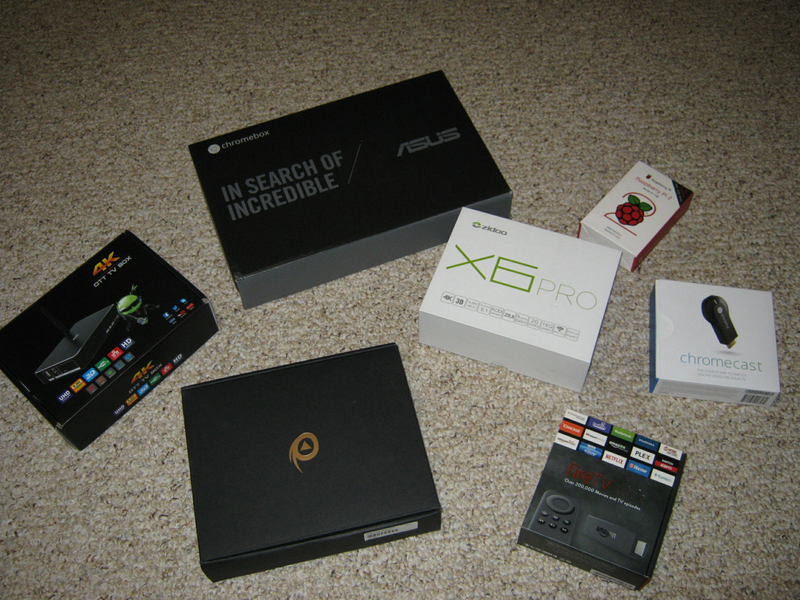 At this point, I no longer recommend an Intel NUC/HTPC for 3D. Compatible h/w is hard to find and the Kodi 3D MVC fork hasn't been updated in ages. Zidoo X-series and the new Zidoo Z-series are both solid choices for 3D MKVs and ISOs. Raspberry Pi 2/3/3B+ also remain solid choices provided you don't need HD/object-based audio bitstreaming. Disclaimer: The ratings below are both objective and subjective (but, ultimately subjective). Any media player will either pass or fail A/V tests, but for 3D quality and overall PQ, I rely on my eyeballs . The opinions expressed in this post are solely mine, and I never let manufacturers influence what I write. The Kodi foundation or team have nothing to do with any content in this post. Please use below as a starting guide, ask questions in this or other 3D threads, conduct additional research and make up your own mind. Players with 'A' grades are not perfect. Nothing is. However, 'A' players get the key requirements of this thread right, with any shortcoming noted. In below, '+' denotes a positive, '-' a shortcoming, and '>' is neutral. + Simply gorgeous 3D PQ! Very detailed, amazing depth, spot-on saturation, and just crystal clear! + Plenty of h/w choices; just see thread linked above! Dell Inspiron Micro 3050 ($150 or less). Windows 10, 32GB SSD and 2GB RAM all included. Nothing to assemble, fairly plug-and-play. See my review here. For just Kodi use (and maybe web browsing), an excellent value, but obviously not as fast an i3 or i5. 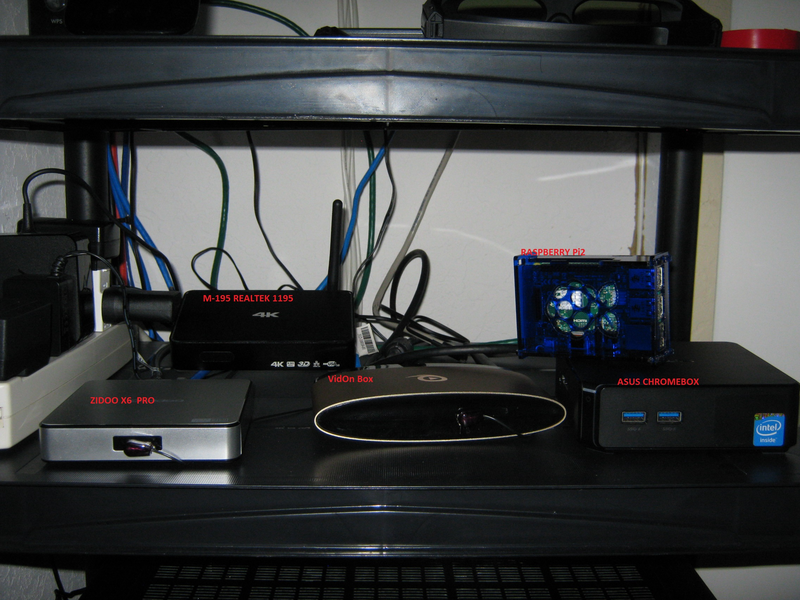 Intel D34010WYK NUC (about $190 all in; read how below and in my review). Buy the NUC used off eBay, plus 32GB SSD (16GB is fine as well) and 4GB RAM. Must assemble these yourself, but not hard. Get Windows 10 free this way (it's legit). Intel D54250WYK, NUC5i5RYK or NUC5i5RYH NUC's (over $400). With SSD and RAM added, pricey. And, not really necessary for mostly Kodi use. It's overkill, but if you want a powerful HTPC, may be worth considering. + 3D ISO's + 3D MVC MKV's + full HD audio bitstreaming + full 4K! + 3D ISO's + full HD audio bitstreaming + full 4K! + Small footprint and fairly cheap! Please see this post in wrxtasy's 'Pick the Right Kodi Box' thread to understand what kind of Kodi 3D boxes are available (and how 3D is implemented by manufacturers). Why can't all Kodi 3D players support full 3D as seamlessly as RPi2/3 (and now Intel h/w with Windows) do? See noggin's explanation here. For naming your 3D videos so whatever skin you're using properly picks them up, see here for ISO's and this wiki. Want Full-featured 3D with Windows? Check out @brazen1's thorough guide! While the latest Intel drivers and Kodi MVC builds support 3D ISO and MVC MKV playback, only way to get menus and additional features remains via external players like PowerDVD and TotalMedia Theatre for Kodi to leverage. For widest compatibility with 3D Kodi media players, I recommend ripping 3D Blu-rays to ISO, either full disc via AnyDVD HD or movie-only ISO via AnyDVD HD & tsMuxeR (see guide to do this here, and rely on this to identify forced forced subs to mux in). MKV is a more efficient container and requires less CPU power to split/play vs. ISO, but only RPi2/3, Intel (HT)PC's under Windows 8/10, and couple of other players (like Himedia H8 & Zidoo X6) support it. Another benefit of ripping to movie-only ISO's or MKV's is forced subtitles. A number of players don't support it, so if you separate the forced sub only, you can create a new ISO or MKV with just that subtitle track. This appears to be intentional by studios. See this thread over at Blu-ray.com for details. Most 3D Blu-ray's are left-eye first, but a few are authored right-eye first. This isn't an issue for actual Blu-ray players, but can often be for Kodi and media players. For these, unless the player/app can detect right-eye first and auto-invert, you'll need to do this manually via the player's flip-eyes or swap-left/right function. Otherwise, the 3D picture gets displayed improperly and looks garbled (sort of like looking into a mirror with multiple cracks). 3D, HD audio & framerate test clips collection: Please see this wiki. Avatar (2009) Still an awesome experience as ever! Can't wait for sequels to hit! Despicable Me 1 & 2 (2010/2013) Don't miss the made-for-3D end credits! Doctor Strange (2016) Great movie, excellent 3D! Enchanted Kingdom (2014) A must watch with ATMOS! Everest (2015) Excellent 3D + ATMOS = total immersion! Ghostbusters (2016) Terrific fun, w/plenty of ghostly, in-your-face pop-outs! Gravity (2013) With ATMOS, it's one of the most immersive experiences to be had! IMAX: Journey to Space (2015) Excellent 3D and ATMOS! Jaws 3 (1983) Great use of pop-outs! Kong: Skull Island (2017) 3D makes the movie better! Kung Fu Panda 1, 2 & 3 (2008/2011/2016) All 3 have excellent 3D! San Andreas (2015) Another demo-worthy title with ATMOS! The Young and Prodigious T.S. Spivet (2013) Underrated gem conceived in/for 3D! Bigfoot Junior (2017) With Ben Stassen behind this, need I say more?! Drive Angry (2011) Very definition of 'guilty pleasure'; terrific 3D! Journey to the Center of the Earth / Journey 2 The Mysterious Island (2008/2012) Great pop-outs! Michael Jackson's 'Thriller' sequence from 'This is It' 3D Blu-ray Pop-out scares galore! Fun! Is there any benefit of Zapitti 4k over other RTD1195 players? Just wondering if it deserves a separate column. 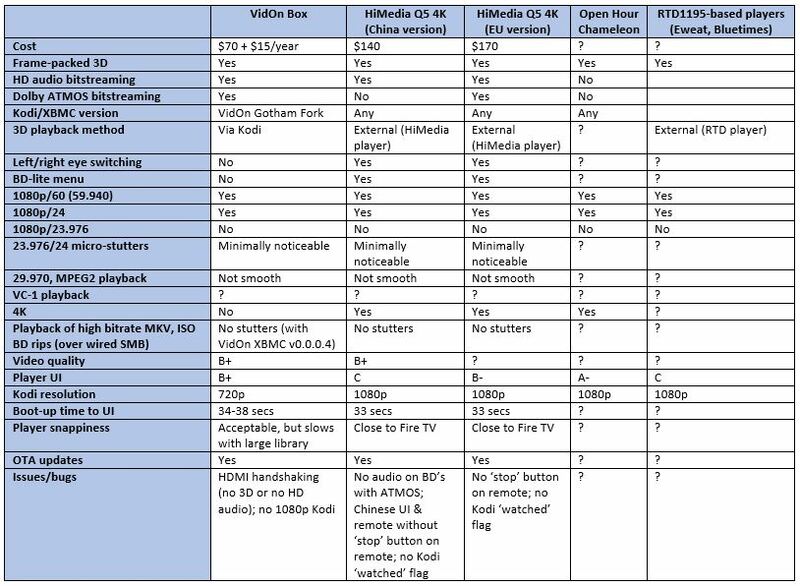 (2015-03-16, 00:44)hdmkv Wrote: Thought having a chart like this would be helpful as we're getting more choices for Android-based players capable of Kodi, 3D ISO (frame-packed) playback, and HD audio passthrough. Ideally should have all these features to qualify as an all-in-one-box. What do you guys think? Please help me fill gaps, questions above. Thanks. looun, thanks, I did ask, but wondering if all you listed is TMI (too much information) . Let me see what I can add w/o making list too large. I've updated first post to include Rasberri Pi for now. Also, OpenELEC is now a contender, not just Android. I didn't include Windows (with PowerDVD/TMT) as it's too much work to get 3D and doesn't feel like a set-top device. (2015-03-16, 15:15)hdmkv Wrote: looun, thanks, I did ask, but wondering if all you listed is TMI (too much information) . Let me see what I can add w/o making list too large. I've updated first post to include Rasberri Pi for now. Also, OpenELEC is now a contender, not just Android. I didn't include Windows (with PowerDVD/TMT) as it's too much work to get 3D and doesn't feel like a set-top device. Oh, but we have the full BD-J Menu. I think the so called BD-lite menu is that they cannot work out the full BD-J menu, so they made a lite menu instead. Does full menu work now with VidOn w/BD-J 2.0, via Kodi? - Bootup time of an RPi2 Overclocked on Turbo settings running Kodi 15.0 - Isengard including the 5 second splash screen is 18 seconds. - GUI Speed in Kodi 15 on this platform is very snappy. Faster than my i5 iMac with Kodi on Yosemite. - VC1 playback - Yes - enabled by purchasing a cheap as chips Licence. - DeInterlacing quality beats any some Android platforms. AMlogic S805 deinterlacing superior. (2015-01-31, 17:05)popcornmix Wrote: For DVD resolution the Pi will do a Motion Adaptive Deinterlace similar to YADIF. For higher resolutions (e.g. 1080i) it will do Bob. Both will optionally double framerate. - H265 decoding at the moment limited to approx 1.2Mbps at 1280x720p resolution, likely to improve slightly with NEON multicore code optimisations. Not had a Pi before, but ordered a Pi 2. Is it fairly easy to overclock as you suggested? A guide somewhere? Thanks. What do you mean by metadata reading & sorting/selecting? Speed while scraping & when loading/browsing libraries? How to select music with tags. But sorry I did a mistake about that, this is a software feature and this table list hardware features. Never mind about the tags. Maybe ISO/folder playback is a software feature as well.